You; Man; Nature | Auti-boy! I’m at my happiest when enveloped within the natural environment that, once, was all our ancestors knew. It was there, pending our efforts to control and manipulate it. Now, the ‘norm’ of control and manipulation is the thing I seek to escape, and the natural environment is the place that offers me the comfort and safety I knew as a child in the protective hug of my Mother’s arms. I am in awe of the infinite sources of inspiration that nature provides. I have met few people who have truly inspired me, but of those that have, it has been their setting of an example that has shown me something worth considering, perhaps a behaviour worth adopting. I have had an alternative perspective demonstrated that, naturally, made me stop, think, consider and then act. That is rare. That is what makes it valuable. So rather than get locked down into the disappointment I feel in the majority of people I meet, I’ve come to realise that’s just the way it is and I’ll look for my solace in the amazing power of nature’s offerings far more often than I will among people. In nature it’s there in abundance. The most rewarding work I’ve ever done has been in conservation and horticulture, in various forms but the most rewarding people I’ve worked with have been learning disabled adults with whom I would explore the many teachings to be found within nature. The exchanges of information this inspired were truly thought provoking and examples of human nature at its best abounded. Inevitably, human nature at its worst took over, on spotting an opportunity to claim rights and responsibility for something special, it became commoditised, sanitised and plundered for meeting the box ticking exercises demanded by funders and authorities. Worse still, it was a charity that claims to represent vulnerable adults that behaves so cynically towards them. There are so many tiers of protection from this sort of thing though, aren’t there, to prevent this happening? Well not to my finding. At every level of pointing out some very poor behaviour I have found the rottenness of human nature runs ever deeper and spreads more widely and I can only fear more for the vulnerable. Now diagnosed with an ASD myself, I have become pigeon-holed into the category that means I am to be shunted around so various services can justify their existence by showing they’ve been there to help me without actually doing so. I’d rather just help myself. There are exceptions, of course, but exceptions they are and all the more valuable they are for that. I’ll value their honesty and decency as a revitalising force among the people I meet but I’ll always turn to nature for my most powerful inspiration. Where man and nature do meet in an expression of wonder, there can be some very uplifting experiences to be found. 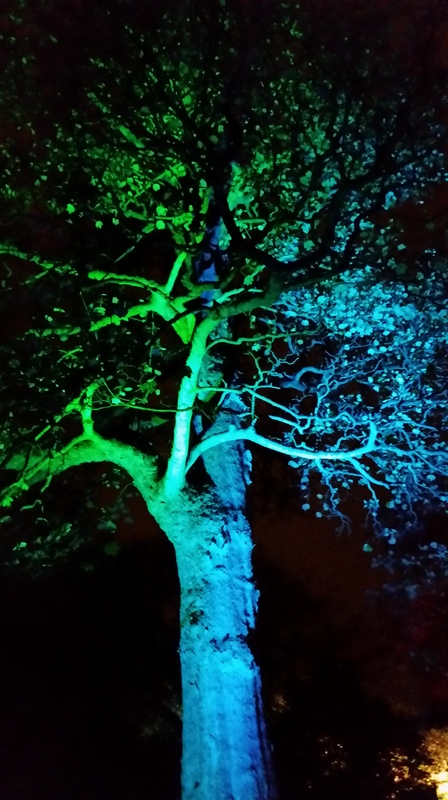 I’ve long been an admirer of the work of Andy Goldsworthy but, this week, saw the effects of Malcolm Innes and Euan Winton using lighting to celebrate the beauty of nature as rarely seen this way, at the Royal Botanic Garden Edinburgh. I think my point is that, while nature can be cruel, its power is untamed and cyclical and ultimately more wondrous and creative in its destructiveness than anything man can achieve. Man (obviously, also meaning woman) can, however, achieve wondrous feats of good without need of justification or qualification, just honest, sincere, straight forward good. To choose to do so is the ultimate power of a human being while making the choice not to do so is the ultimate betrayal of humanity. I can’t avoid contact with people, nor do I want to (completely) but I’m sticking with nature, thank you.